2016 28 Regulator with only 200 hours of very light use on twin 300 hp Yamaha's. "Traveller" is a one owner boat that has been rack stored in the summer and inside stored in the winter months. She comes equipped with a 24" Garmin MFD touch screen gps/radar with optional dash mounted remote. Garmin integrated autopilot, Garmin VHF 200, and Polk Audio stereo. Custom Oyster Harbors edition powder coated T-top from Seamless marine makes "Traveller" stand out above the rest with her flag blue hull, white colored custom true water line boot stripe, and green bottom paint makes her the right color combo. Scroll through the photos or watch the video of her under way to see for yourself. United Yacht Sales New Jersey would love to guide you through a personal showing of this 28' Regulator 28 2016. This yacht for sale is located in Marion, Massachusetts and priced at $225,000. For a showing please contact us by filling out the form on this page and we will get back to you shortly! With its sharp bow entry and deep-vee hull, Regulator’s signature soft ride comes standard – and with the power of Yamaha F300 V6 twins and Command Link Plus controls, you won’t believe where this Regulator will take you.With a flush deck throughout the cockpit and plenty of storage, including a 124-quart transom fish box, 456 quarts of in-deck fish box space or rod storage, and two forward-seat 140-quart storage compartments, there is plenty of room for fishing adventure. 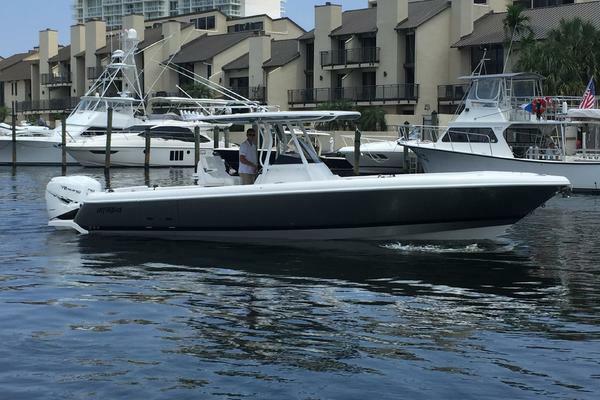 Cushioned bow seating delights sunbathers and the loaded console features tempered glass windshield and optional fiberglass T-top to shield from the sun as you head offshore.